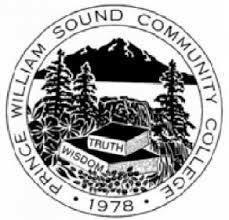 Prince William Sound Community College (PWSCC) is a one-of-a-kind institution of higher education located in Valdez, Alaska. The main campus, together with the extension centers in nearby Glennallen and Cordova and Coppe Basin outreach sites located in Mentasta, Slana, Chistochina, Kenny Lake, and Chitina, are set amidst some of the country̠s most breathtaking scenery and rich cultural history. PWSCC (or ̫P-Dub,̦ as our students affectionately call it) is accredited by the Northwest Commission on Colleges and Universities and is the only remaining community college in the state of Alaska. PWSCC offers Associate degrees and occupational certificates that are hard to find elsewhere, such as our Millwright, Oil Spill Response, and up-and-coming Outdoor Leadership programs. With over 25 undergraduate programs to choose from, including baccalaureate programs offered through partnerships with our sister universities in the University of Alaska system, it̠s easy to find a program to fit the academic interests of almost anyone.With NO OUT-OF-STATE TUITION, Prince William Sound Community College caters to a total student population of 1,400 students, comprised of many out-of-state and international students, distance learners, and rural students taking courses through one of several outreach delivery sites. Small class sizes, a close-knit campus community, and one-on-one interaction with staff and faculty shape an intimate learning experience. We have no crowded lecture halls, long lines for registration, or limited parking. Newly remodeled student housing affords students a chance to live independently in fully furnished apartments among their peers. Recreational opportunities abound for outdoor enthusiasts in the nearby mountains, waterways, and glaciers.The small-town charm of Valdez and the surrounding beauty of the state̠s most pristine wilderness help to make Prince William Sound Community College one of Alaska̠s best-kept secrets. Daily flights and a well-maintained highway connect residents to the shopping and cultural attractions of Anchorage̠s city life.With several highly transferrable Associate Degrees and several Bachelor Degree opportunities, PWSCC is an optimal place to start your college career and the next step in your life̠s adventure. P-Dub is not just a small college in a small town; it is a dynamic living/learning community that fosters inspiration, growth, and learning . . . naturally.